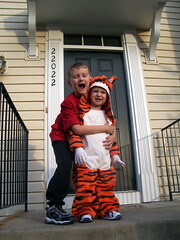 The boys were the illustrious Calvin and Hobbes for Halloween this year (Max’s idea). Max was actually dual costumed, being both Calvin (seen here) and Spaceman Spiff. Lots and lots of pictures are over here. Brian totally dug Halloween and lasted much longer than Max when it came to trick-or-treating. His bucket came back full and then he hung out with us on the step stealing candy from his Aunt Heather and trying to blow out the candles in the jack-o-lanterns. Fun was had by all. That’s one creative kid you’ve got there. Really, that’s an impressive abuse, I mean use of a younger brother. Awesomest costume idea ever. EVER! Thanks, the boys had a lot of fun (this is really just a test to see if FastCGI is working).